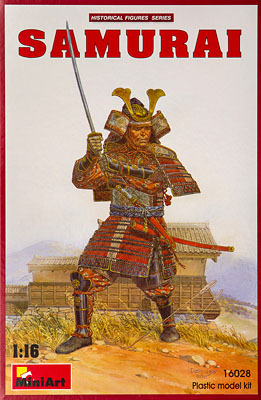 The samurai was the term for the military nobility in Japan. The samurai evolved from the reforms implemented after the Japanese loss in Korea in the mid-600s. The political structure of Japan varied for the next several centuries with a decline in central power. Powerful clans rose up to fill that power gap, and the need for protective military for those clans became important. Alliances developed, and a strict code were established to organize soldiers and police. The samurai class evolved according to that code, originally restricted to arresting rebels and helping to acquire provisions for the army. By the end of the 12th century, the samurai class and expanded to become the major political ruling power in Japan. 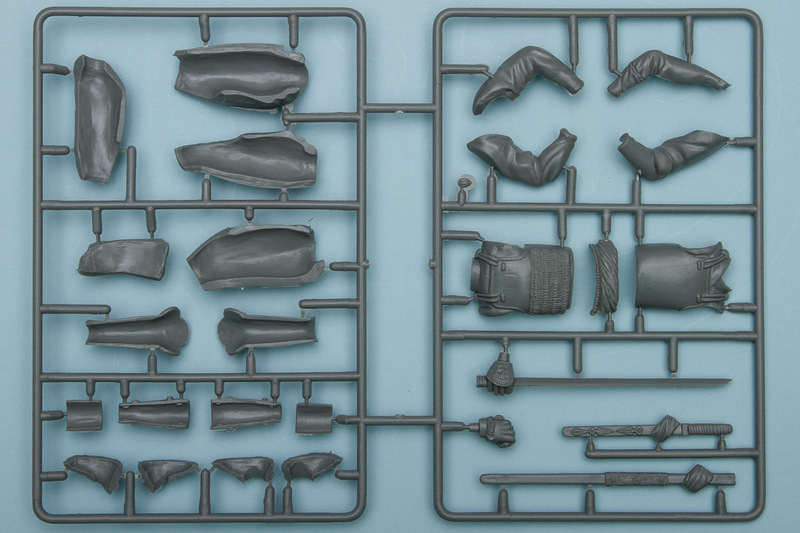 MiniArt has produced several 1/16 figure kits, and their latest tackles a challenging subject: the samurai. This is challenging because of the ornate armor worn by the samurai, but this kit does a pretty good job of replicating that. 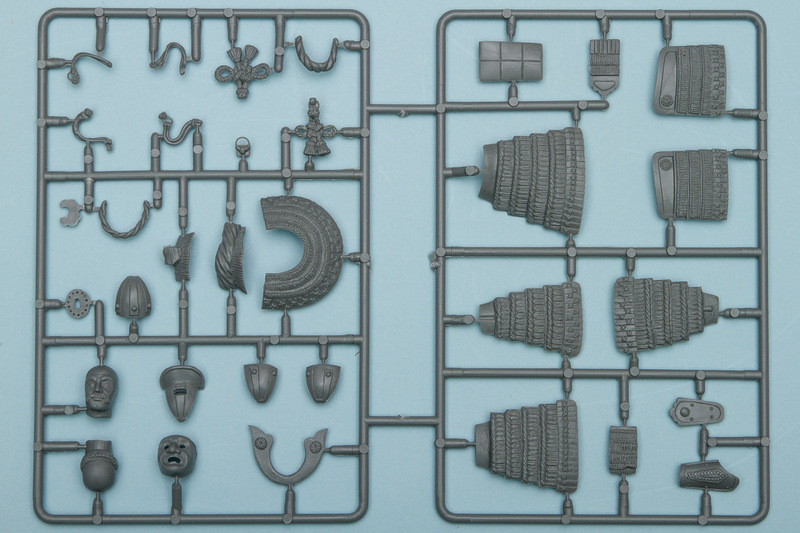 The kit is molded entirely in plastic, and understandably is rather complex. There are no decals or other accessories provided, so the finished model will rely entirely on your hand in painting to cover all the details. The instructions are nicely done with all the steps depicted with actual photographs of the kit parts. It will be wise to follow these closely, as the kit looks to be one that requires a specific order of assembly. The lower body is made up from five pieces for the thighs and seven pieces for the calves and feet. Over this fits the armor skirt, which is made up from four pieces. The belt and scabbard comes in six pieces, which finishes out the lower body assembly. The upper body starts out with three main pieces before moving on to the arms. There are seven parts making up the arms, while the head is made up from two pieces. The remainder of the parts make up the chest armor and helmet. There is an option to provide a mask for the face. The helmet is really nicely detailed, and by the time you've added all the accessories in the final step, you will have assembled a total of 59 parts. And guess what, folks, that's the easy part, because next is the painting. The painting diagram is actually rather nicely done. You get a front view and a rear view color painting, with paint callouts. It doesn't take much effort to notice that there is a lot of fine details to paint here. A LOT. The armor skirt has a basic pattern to it that is marked clearly, but the exposed clothing is patterned, and all of that will need to be hand-painted. Close examination of the painting shows some very intricate design work on the armor and helmet, which will be quite challenging to paint. When done, though, this kit will truly be an incredible figure to display. The 1/16 MiniArt figures remain some of the best injection molded figures out there, and this one is no exception. It will be a fairly simple build combined with a complex paint job, but should you pull it off it will be a memorable model. My thanks to MRC for the review sample.